IMPORTANT - Adjustments to morning dropoff & afternoon pickup arrangements. Evacuation Procedure complete - all clear. Normal dismissal procedures in place. A Message from Bishop Vincent Long OFM Conv. Information for ALL students, parents & caregivers. All buses have arrived at school safely. ALL buses have now arrived at school. The remainder of the day will be as per timetable, Day 2. Bus 3034 arrived at school safely. Dear Parents & Caregivers, Bus 3034 has arrived at school. All students on board are safe and okay. Accident Annangrove Rd - Buses late, students are safe. Hillsbus Service - Update commencing 11 February 2019. Important Information regarding student absences and late notes. Hillsbus Service - Update commencing 4 February 2019. Information for Parents & Caregivers regarding the Australian Government Data Collection. Important Information regarding Cross Country Carnival. Information for Parents & Caregivers of selected PDSSSC Tennis Teams students. Information for Parents & Caregivers of selected PDSSSC Cross Country Carnival students. Information for Parents & Caregivers of Year 12 Ag Students. Information for Parents & Caregivers of Year 9 Food Technology Students. Information for Parents & Caregivers of Year 9 Ag Students. Information for parents & Caregivers regarding 2019 Swimming Carnival. Information for ALL families - Raffle Tickets. For parents & caregivers of selected Dance Company students. 2019 Student Information Collection Notice - Important Information for ALL Families. Dear Students, Parents & Caregivers, A dental retainer has been found. If you or your child has lost their's it is available at Student Services. The cross country is going ahead today as planned. Hillsbus Service - Update commencing 29 January 2019. Information for parents/caregivers of current Year 7 students. Please read Important Information regarding the College Bushfire Response Plan. All leave must be approved by the College principal. A free parent forum presented tomorrow evening in Castle Hill. If your child catches a bus to or from school, please read. Make sure students are tapping on and off! Health information for all families. How to turn off certain notifications from School Stream. 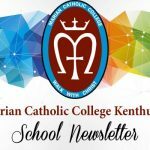 The first Marian Newsletter for Term 1, 2019. Enjoy your weekend. Happy reading. Farewell from Miss Ward, and this fortnight's newsletter. Last newsletter for Term 1! Marian Newsletter for Week 5, Term 1, is here! We have a huge newsletter this week, full of important information and recounts of recent events! The first Marian Newsletter for Term 1, 2018 is here! Vaccination Information for Year 7. For Parents & Caregivers of Year 7 students. Information for Parents & Caregivers of Year 7 students. Year 7 (2019) Information can be found here. Please view the categories here to receive information relating to year 7. All notes and permission forms relevant to Year 7 (2019) will be available in this category folder. Year 8 (2019) Information can be found here. Year 9 (2019) Information can be found here. Information for Parents & Carers of Year 10 students. For Students, Parents & Caregivers of Year 10 students. For Parents & Caregivers of Year 10 students. For parents & Caregivers of Year 10 Agriculture Students. Year 10 (2019) Information can be found here. Information for Parents & Caregivers of Year 12 Geography students. Information for Year 11 SLR parents & caregivers. Year 11 and 12 leaders only. For Parents & Caregivers of Year 11 students. Year 7 & Year 11 - Winter Uniform Fittings Year 7 & Year 11 only. Information for Parents/Caregivers of Year 7 & Year 11 students. For parents / carers of students in Year 11. Information for Year 11 Students, Parents/Caregivers. Year 11 (2019) Information can be found here. Please view the categories here to receive information relating to year 11. All notes and permission forms relevant to Year 11 (2019) will be available in this category folder. Information for Year 12 parents/carers. Year 12 (2019) Information can be found here. Please view the categories here to receive information relating to year 12. All notes and permission forms relevant to Year 12 (2019) will be available in this category folder.